This morning I found a great new website (well, new to me), called Barter Quest. It’s in beta, which means that it might have a few kinks to work out, but it’s amazing. Simply put, you take that hideous gift Aunt Sally sent an item that you no longer want/need and put it up for trade. Then you search for another item that you actually need or want. You take the reindeer sweater that was sent to you as punishment for wrongdoing a gift last year and snap a photo of it. 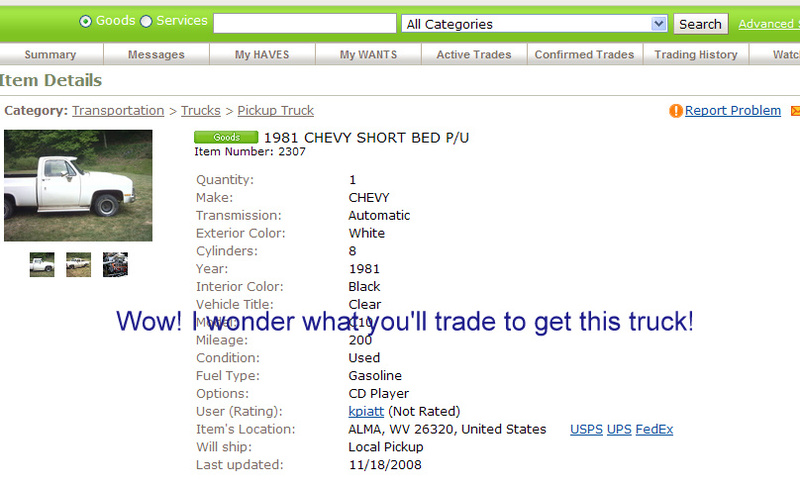 Next, take a look at what you want, and populate a want list. Finally, a match is made, both parties (maybe more than two) send out their items, and the only cash outlay is shipping (nominal). There’s a really cool algorithm that’s been patented, but I won’t even try and pretend that I understand it. Keep in mind that swaps are only free for a short time. If you complete a trade during this invitation only period, all your trading activity in the year following our public launch will be free. The bottom line is that three super smart, hardworking guys were sitting and drinking coffee discussing the surge of business bartering. They started to wonder why no one had created an efficient online barter platform and they perceived that there were no good technologies supporting the bartering sites allowing for the instant matching of haves and wants and multi-party trades. Therefore they created a patent pending Matching engine that does exactly that, instantly matches your haves and wants for both two and multi-party trades. If you think of the three R’s Reduce, Reuse, Recycle BarterQuest is the epitome of green and in a crappy economy, it’s the startup I’d be betting the farm on. For those of you who don’t know, I came to blogging after 9 years of being an eBay powerseller. The horrid economy had me close up shop, and I’ve never looked back. Now, I can look forward, because although I don’t miss measuring inseams and writing snappy copy, I do miss emptying out closets and getting something in return. I guess I’m saying, “trust me. I understand online commerce and I know a good thing when I see it.” Also, getting a great username is limited to the first million or so people, so act fast. Details here, FAQ Here and connect with me on BarterQuest, my username is Jessica and my kids are growing quickly. Jessica Gottlieb is a freelance writer in Los Angeles; this is an original post to Eco Childs Play. hey sounds like http://www.swaptree.com. I learned about swaptree from some your fantastic articles. I love it, and its totally free. Checked out http://www.barterquest.com Very impressive! You can barter any goods, services and real estates. Oh, they have launch promotion going on “”trade with barterquest” ipod touch, wii game and prada bag if anyone interested. I’m gonna bid on ipod. @tina it is a lot like swaptree only you can post everything from coatracks to timeshares on this site. @james I think that the free swaps are good until the end of February 2009! I’d get involved now. Y’all be sure to add me to your friends list there. I just posted brand new ipod at http://www.barterquest.com. Yes, it was Free. my id is jwhite if anyone wants to barter with me. I’m gonna post bunch later.